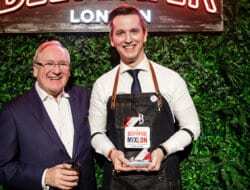 Maxim Schulte was recently awarded first prize in the world’s biggest gin-based cocktail competition, Beefeater MIXLDN. His winning tipple Stack of Fortune takes inspiration from his home city of Macau, which is playfully nicknamed the Las Vegas of Asia. The colourful concoction certainly brought Maxim good luck – try for yourself what ‘the best’ really tastes like by remaking this jackpot of a cocktail at home!